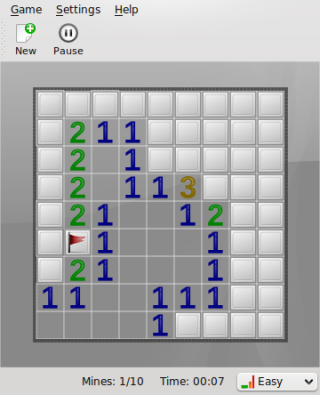 Minesweeper is a puzzle game where the player has to find all the cells (usually 2-dimensional) with mines by clicking all the cells without mines to get the numbers of mines in the nearby cells, but never clicking the cells with mines. Find the mines, don't step on them! emMines is a free game. This means that the source code is available to be studied, modified, and distributed. Most projects look for help with testing, documentation, graphics, etc., as well. emMines is a 3D minesweeper game that is included in the Eagle Mode environment. Written by Oliver Hamann in C++, it is released under the GNU General Public License version 3. As of 2008-06-25, the latest version is included in Eagle Mode 0.71.0. KMines is a free game. This means that the source code is available to be studied, modified, and distributed. Most projects look for help with testing, documentation, graphics, etc., as well. KMines is a mostly classical minesweeper puzzle game from the KDEGames division of the KDE Project. There are three preset levels and a custom one. The last one allows the player to adjust width and height of the playing field, and the number of mines. Simon Tatham's Portable Puzzle Collection is a free game. This means that the source code is available to be studied, modified, and distributed. Most projects look for help with testing, documentation, graphics, etc., as well. Simon Tatham's Portable Puzzle Collection is a collection of multi-platform single-player puzzle games written mostly by Simon Tatham and licensed under the Expat license. Portions of the collection are by Richard Boulton, James Harvey, Mike Pinna, Jonas Kölker, Dariusz Olszewski, Michael Schierl, Lambros Lambrou, Bernd Schmidt, Steffen Bauer, Lennard Sprong and Rogier Goossens. This page was last edited on 30 August 2013, at 08:10.